When you have started SiDiary for the very first time, it will show you the profile-wizard. 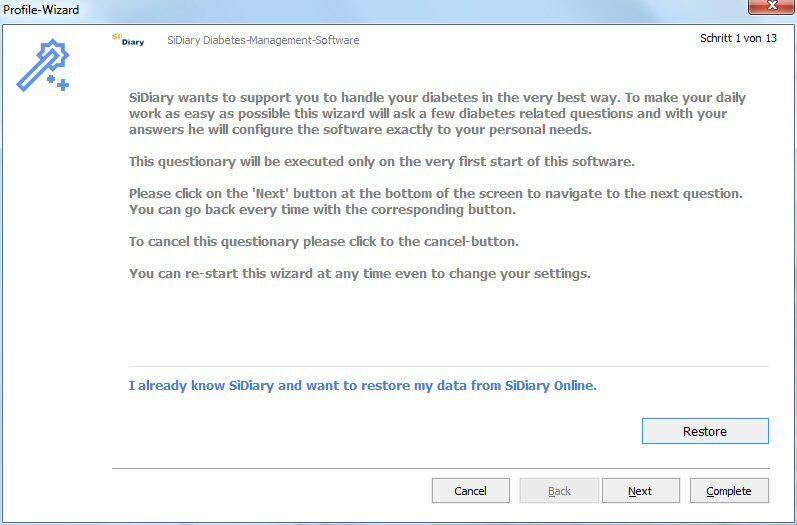 This tool will ask some diabetes-related questions and from your answer it will configure the software especially for your individual needs. Now you can start immediately with data capturing! Click on the grid at any place and enter a value (Blood glucose levels will be re-ordered to the appropriate row automatically) With the arrow buttons you can navigate to the previous or next day or week or you can open a calendar picker or the nutrition database. Also you can start the wizard for sending your (encrypted) data by email or to read your blood glucose levels from a BG meter. When you've tracked some readings, you can use the trend function for a rating and a trend of your current condition. You can select a time range and will get the results with the 'Refresh' button. Of course the results will become better with more captured data! 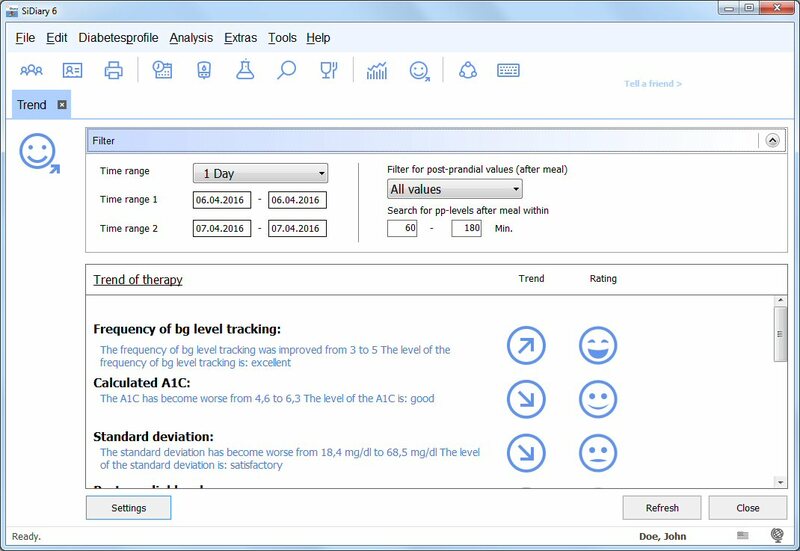 All limit values for the ratings can be predefined with your individual settings (settings button) and additionally you can track your lab results (A1C, kidney parameters etc.) on this tab with the lab result button. You can analyze your data with detailed statistical graphs. You can filter the events, time range, control times and s on. The times for these control times (Before breakfast, after lunch, etc.) can be specified also at the menu 'Diabetesprofile ->Control Times'. The A1c interpolation can only be used, if you have selected a bolus insulin with a effect profile. With this option the calculated A1c will be much more realistic and closer to the A1c values coming from your lab. With the arrow buttons in the time range you can move the analyzed time range, i.e. to compare a weekly data basis. Some functionalities (i.e. 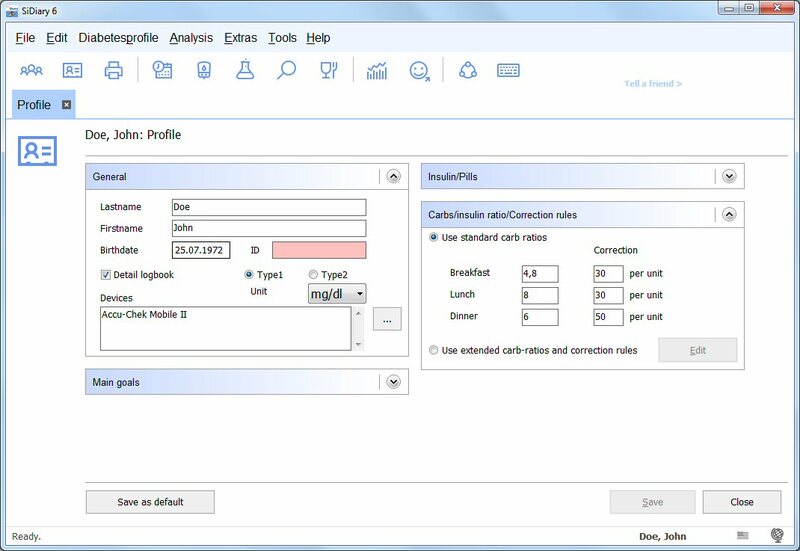 bolus dose calculation) need a configured diabetic profile, which you can set-up on the profile tab or within the profile wizard. Please find below some information about how to enter the correct ratios and correction rules. What to enter for carb ratios and correction rules? Within the profile wizard or on the profile tab you can enter the details needed for the calculation of a bolus dose: When you've entered a blood glucose level and your carb intake, SiDiary will calculate a dose for your bolus injection. To make this work well for your individual purposes, you have to set-up how many insulin units you have to inject for each gram of carbs, for each main meal type (breakfast, lunch and dinner). For example if you have an intake of 60 gr. of carbs at breakfast and you will inject 8 units of your bolus insulin your CH ratio for breakfast time will be 0.133 by using the European formula (language settings). If you have selected the US formula, you would enter the number of carbs which are covered by 1 unit of bolus insulin! You can set-up three different ratios for the main meal times since they could vary. Additionally you have to specify your correction rule for the main meals: The correction rule is for situations where your blood glucose level is too high. If that is the case, then you will have to inject a little more insulin not only for the intake of carbohydrates but to get your bg level down to target as well. If you've entered a value of 30 for example, the program will add a correction dose of one insulin unit for each 30 mg/dl too high. 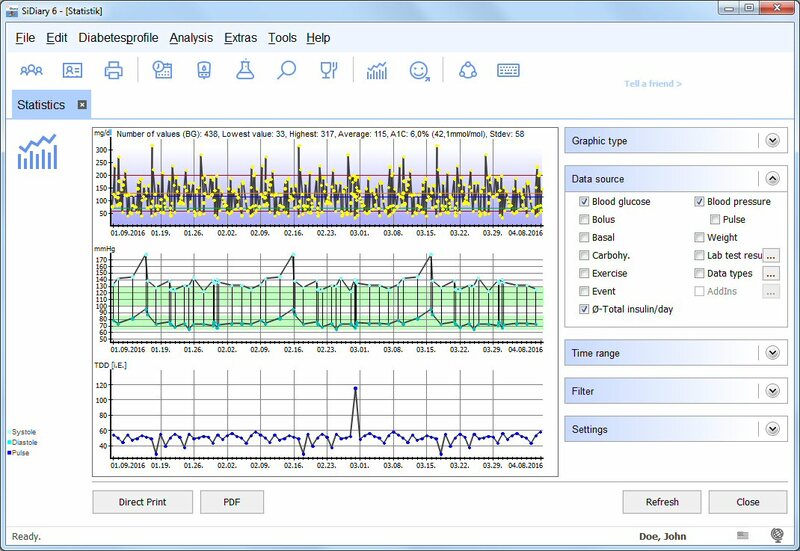 If you have installed the predefined US version of SiDiary, this package comes with settings for using the US bolus formula and am/pm time format. If you have installed the multi-language package you will see the language selection screen on the very first start of the software. 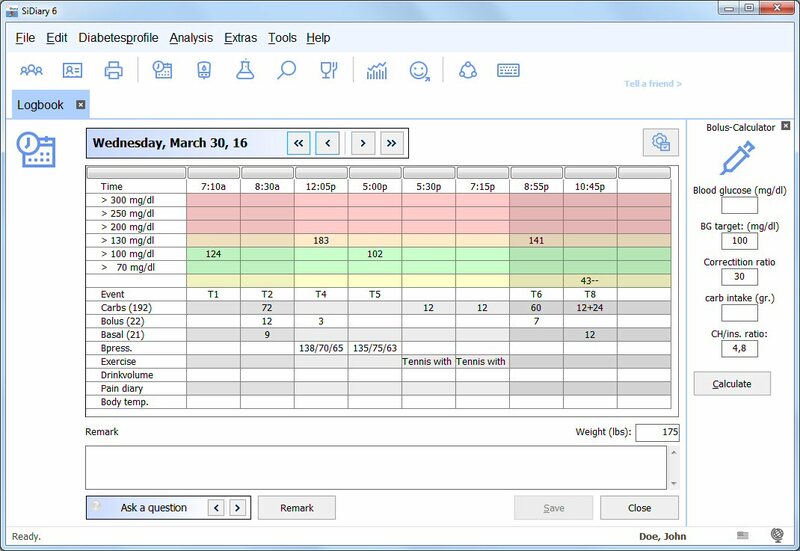 On this screen you can also select from the 2 bolus formulas! *) assuming that 100 mg/dl is your blood glucose target level. This target value is the middle of the both values entered on the profile tab! Blood glucose readings can be marked with - or -- as a normal or a heavy hypoglycemia. These inputs can even be used without a monitored bg level. You can mark a Bolus- and/or Basal-input to be an injection of your second drug type by adding a * If you are usually using a normal short acting insulin but have also something like Humalog for corrections of extra-high levels, you can enter 5* to track a correction with your rapid acting insulin. You can split the input of a bolus injection to track the units for correction separately from the units for your carb intake: Just enter 2+7. SiDiary will use the sum for the statistical calculations. If you are unsure about the amount of carbs for a meal you can enter i.e. 30-40 (or the exchanges BE, KHE etc.) SiDiary will use the middle for the statistics, in this case 35. If you want to enter 0.5 you can start with the decimal point. SiDiary will add the leading 0.